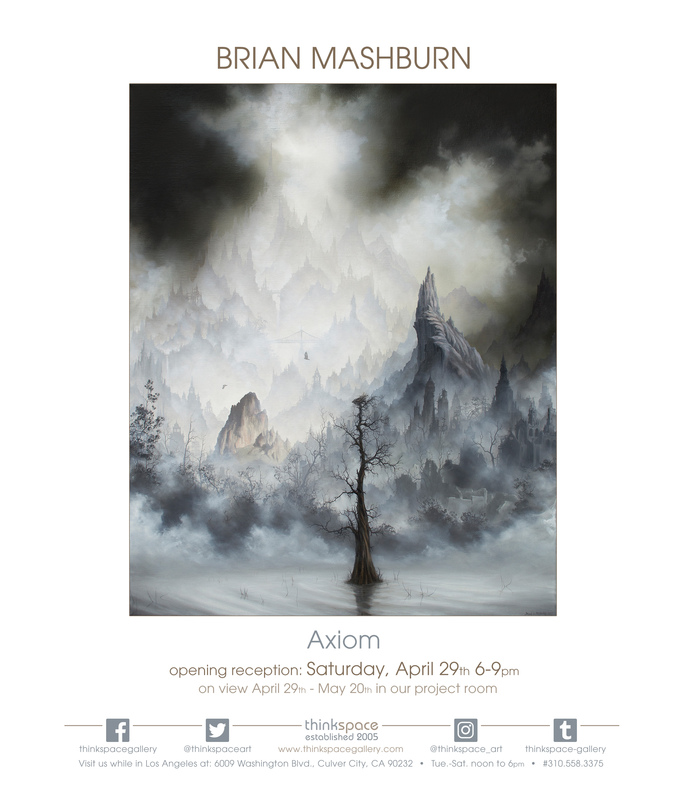 Concurrently on view in Thinkspace’s project room are new works by Brian Mashburn in Axiom. Based in Asheville North Carolina, Mashburn creates phenomenally detailed oil paintings of foggy landscapes, in which remnants of the natural world exist uneasily alongside evidence of its all but complete industrialization. 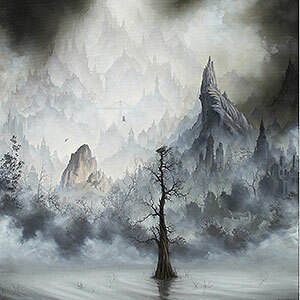 Dark and brooding, the stylized moodiness of Mashburn’s work is inspired by the foggy mountains of Appalachia and the heavy, opaque smogs that descend upon Hong Kong and parts of Southeastern China. Like a tangible veil, the gray film is itself a dark harbinger of the destructive forces of industry. Mashburn’s landscapes are indistinct and seemingly sooty vistas, where spires of human architectures and crags of rocky mountains carve out its backgrounds. Darkly and otherworldly, they share similarities with the tradition of 19th-century gothic landscape and its championing of all things eerie, though they feel distinctly contemporary and surreal in their free mixing of historical and cultural references, architectures, and animals. Mashburn depicts hyper-realistically rendered wildlife in his foregrounds, often posited in stark contrast to the vaporous looseness of the distances. Whether an owl, buffalo, dog, or elephant, the individual isolation of the creature, its contextual disjointedness, and abrupt displacement, when found in the midst of this caliginous world, is jarring and ominous, particularly when set against the traces of human development which are all too apparent in the beyond.